According to police, the burning debris left behind by the trailer set off multiple spot fires along the adjoining bushland. 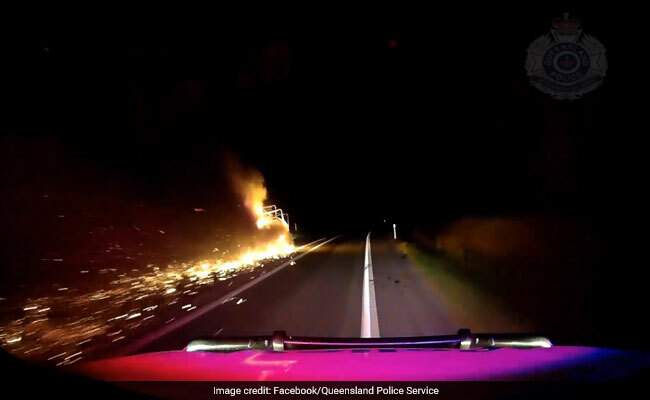 Gripping footage caught on a police dashcam in Australia shows a fully ablaze trailer dragging along a highway throwing burning debris and sparks in its trail. On January 18, police were informed that a trailer had caught fire on Queensland's Bruce Highway. When cops closed in on the trailer, they noticed that the driver kept driving despite the fire, leaving behind flames all over the highway. The trailer was also missing wheels and was being dragged along the road, the police statement said. In a bid to make the driver to pull over, cops activated the siren but the driver kept going. The driver eventually stopped at an intersection after having driven nearly 20 kilometres with the trailer on fire. According to police, the burning debris left behind by the trailer set off multiple spot fires along the adjoining bushland. Queensland Police uploaded portion of the dramatic pursuit on their Facebook page along with a light-hearted dig at the driver. "Can you spot the bright spark? HINT: It's not in the driver's seat," they said. No person was reported injured. The 49-year-old driver is assisting authorities with their investigation, police said. It's not clear how the vehicle caught fire.